When I think of the holidays, I can't help but think of the kitchen and like many of us, our grandmothers. I just spotted this amazing Grandmother's Baking Bowl set over at the Garden and Gun site and wanted to share. They're a smart and beautiful collaboration between Ashley Leckey Schoenith of IceMilk Aprons in Atlanta and Jeanette Zeis of Portland, Oregon (formerly Atlanta). These were inspired by the stacks of mismatched bowls grandmother's seem to always have in the cupboard. 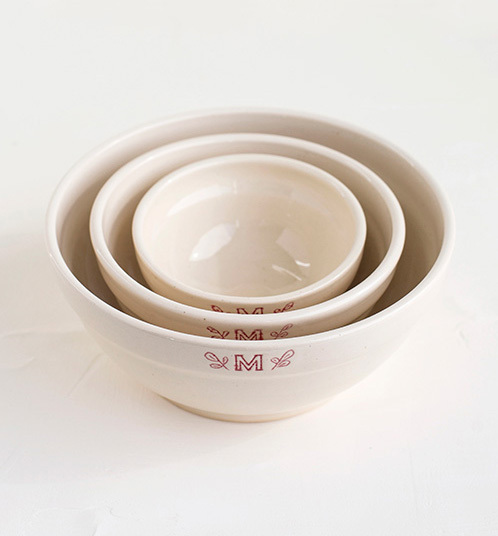 Made of vintage white porcelain clay with the added lovely touch of a red imprint laurel design, this set is one to be used, kept, cared for and passed on to the next lucky family member. 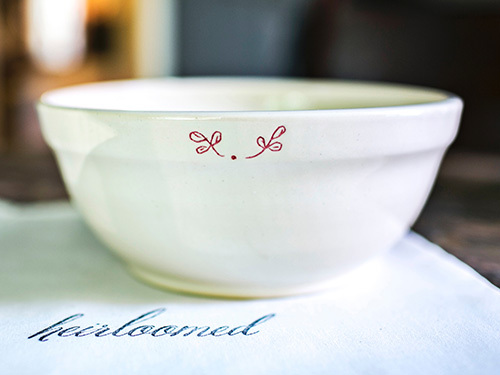 What a great gift- plus Jeanette is happy to personalize the bowls as each is made to oder. Learn more, here.